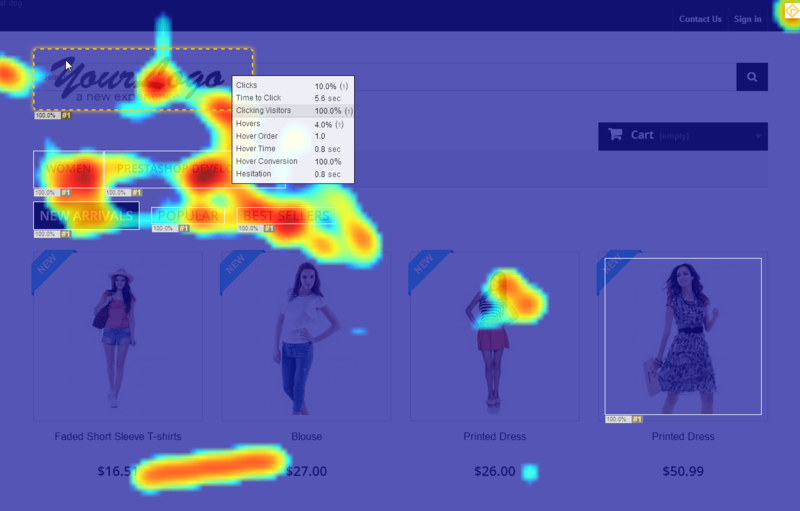 Are you using heat mapping to track visitors on your website yet? If you answered “no”, you are missing out on sales and lost opportunities. Heat mapping software is an excellent way to optimize the conversion rate of your website. Imagine being able to see what people are actually clicking on and looking at on a page. By doing this you can see which elements on your site are generating interest and which ones should be replace with other elements. The best thing about it all is that the module is free and ClickTale has a free forever plan! What does heat mapping mean? With ClickTale the analytics are deeper than heat mapping, they offer several different analytics to help you optimize your website. In the image below you can see where the actual on page clicks are happening on the site. The little white marks represent mouse clicks. One thing you can tell from this metric is that people are clicking in the quick view for product information. 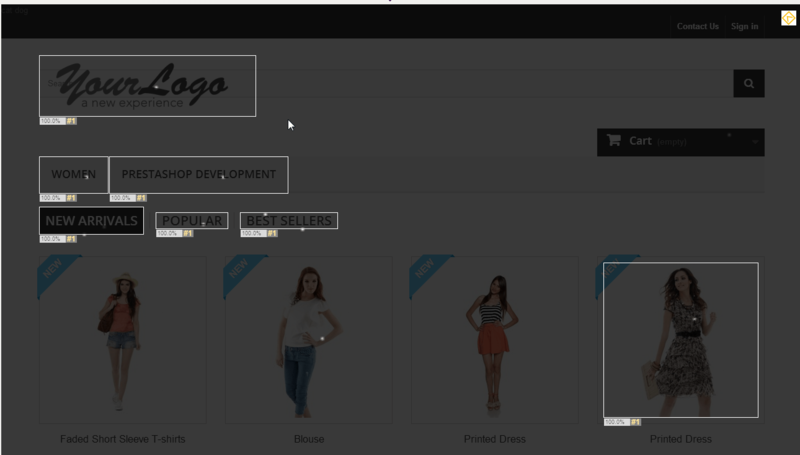 The quick view button is in the center of the product images, that is where people are clicking. I can also see what menu items people are clicking on as well. In the next image below I can see exactly where people are with their mouse on the page, what they are mousing over and what they are not. This way I can figure out which elements of the page appeal to people and which ones do not. This image below is one that I have found very important in website conversions. In the newspaper industry they refer to content that you can see on the folded newspaper as content that is above the fold. This is where newspapers have always put their most important headlines and pictures. The same theory works for websites as well. This image shows where my content is on screen for my average viewer. The analytics that ClickTale provides are so deep and thorough that anyone can increase the engagement and their sales by using it. Once you start looking at them, you will be hooked optimizing your website and finding content that works and increases conversions. The module is very simple to set up and use. Once you download it and install it, you will need to enter the two tracking codes into the module, click save and you will be all set. This module is compatible with all versions of Prestashop 1.5 and 1.6. This module will allow you to install Clicktale heat mapping easily on your website. With heat mapping you can determine which of your marketing materials are working and which ones need to be changed out.